Libertarians candidates have taken on issues big and small all across the state in their latest campaigns, and this is one of the bigger ones that most being forget about. Chicago has more red light cameras than any other city in America, currently topped out at 352. They have been wrought with fraud and abuse since their implementation, when company Redflex installed and operated the cameras. Unexplainable spikes in tickets being issues combined with the tinkering of yellow/red lights themselves in order to generate more tickets and bribes being paid out to Illinois insiders prove that this has never been about public safety and has, as was always believed, to be nothing more than a way to extort money from taxpayers who are already stretched pretty thin. Most people don’t think about these red light and speed cameras until a ticket shows up in the mail, and unless you have plenty of free time or the right connections, it is easier to simply pay the fine and make it go away. 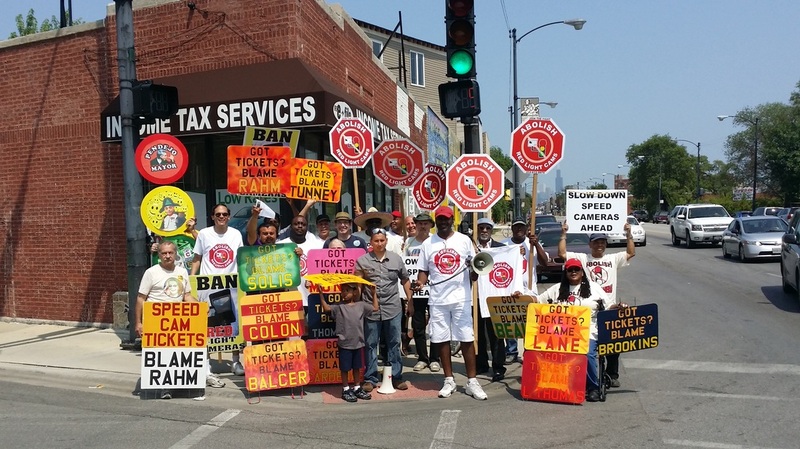 City officials, however, are always exempt from them and the fines that they accrue, most famously from Mayor Rahm Emanuel’s personal driver who amassed a few thousand dollars worth of tickets which were then paid for with tax payer dollars. Of course, Chicago got greedy and continued to install more of these dangerous revenue-siphoning machines, which have since appeared in the many suburbs outside of Cook County. This entry was posted in activism, Events. Bookmark the permalink.